Eleven and a half inches in diameter, lead-free, dishwasher and microwave safe, this richly-colored bowl is handcrafted and painted by Mexican artisans. While a very functional piece, the inside and outside of this 4-inch tall bowl is covered with a textured pattern making each piece unique. 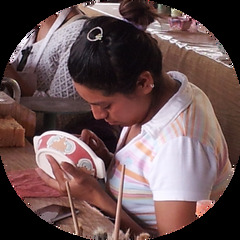 There is no sign to find the small family-owned ceramic workshop in the state of Guanajuato. Behind the large wooden gate, women artisans are hand painting unfired ceramics while men work the kilns, as they have since the late 70's. Each piece has personality from the dots and swirls to the handpainted logo on the bottom. And each is lead free, microwave and dishwasher safe.